Many assert that the planet is warming exclusively due to anthropogenic emissions, and that this warming is leading to both global ocean acidification and to earlier peak streamflow runoff known as the Early Spring (ES), somewhat localized to the Western United States. For one of many examples which provide an apparent foundation to the ES, I have examined a recent edition of the report known as Climate Change in Colorado CIRES Summary  the report states that: The timing of snowmelt and peak runoff has shifted earlier in the spring by 1–4 weeks across Colorado’s river basins over the past 30 years, due to the combination of lower SWE since 2000, the warming trend in spring temperatures, and enhanced solar absorption from dust-on-snow. The featured image accordingly is intended to capture the exploration of a peak flow for a representative stream in the western United States. In this instance the focus is on the monthly average record for the Animas River at Farmington, New Mexico, whose headwaters reach deeply into the highest peaks of the San Juan range of the Southern Rocky Mountains of the western US within Colorado. I often focus my attention on the Animas River, if only because of its relation to sunspot numbers, I have recently completed an Animas paper for a related conference proceeding sponsored by the New Mexico Water Resources Research Institute (WRRI) based at New Mexico State University at Las Cruces, NM. In that work I’ve already presented, I’ve run an array of hydrostatistical and performance measures to the time series records, both measured and modeled, of that and related streams. Here in the featured image I have chosen in part to unroll the specific Animas monthly streamflow data and use Microsoft Excel’s cell color ranking formatting features to quickly detail the deep-green band. The green band traces through each month of peak flow. I’ve added a supporting chart within that image which identifies the peak flow month in a more conventional mode. The apparent conclusion must be that across this basin there is little or no evidence of a descent of the peak flow month for the full complete available history of the stream. This result supports the related argument that there is no evidence of an earlier spring than normal. Moreover, there are now excellent arguments that the hydrologic runoff is strongly and significantly correlated across most if not all seasons and years to well mapped ocean indexes and even in some cases directly to solar cycles. The next image replicates related items that I and others have explored for approximately the past decade or so. 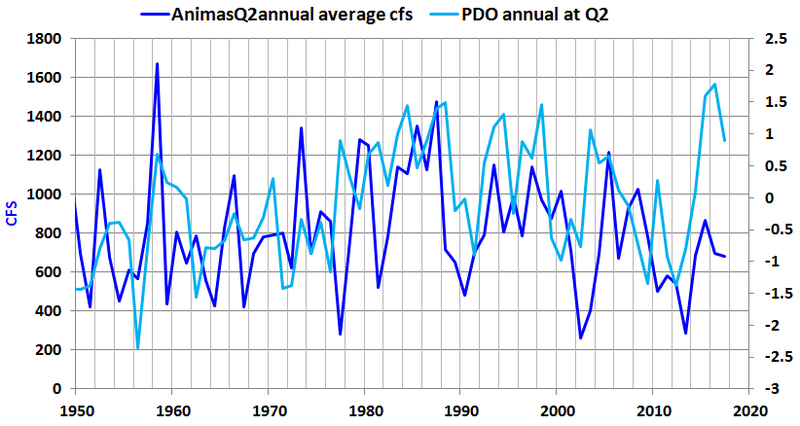 In this chart the actual (versus “peak rank” of the previous image) Animas flows are simply compared to the Pacific Decadal Oscillation (PDO) over an available continuous Animas record span dating back to the first half of the 20th century. It would not be a surprise to many hydrologists that the relative peaks and dips are fairly synchronous. This is excellent independent confirmation I feel of the SNOTEL values but is only an informal part of an informal exercise. I don’t mind repeating that the attachment appears to demonstrate that the Animas example and others are consistent with the SWE outcome. 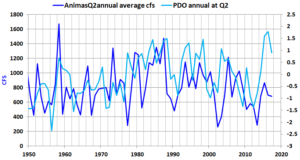 However that and other papers covering the SWE outcome, and which also assert an early spring, do not incorporate the PDO. It accordingly may be that the early spring notion largely predates more widespread recognition of the influence of the PDO. In any case, I expect that early spring notions will soon be eclipsed as understanding grows regarding the failure of the observations to support the Early Spring assertions, as well as the many demonstrations at this site which point to more accurate ocean and solar based forecasts of streamflows in the Western US, including of course, the Animas River. In a future set of posts I will expand from the Animas diagrams shown to produce similar graphs for a wider range of streams. I have already worked to compile many of these, including for example, Twin River near Round Mountain, Nevada, the North Fork of the Big Lost River near Chilly, Idaho, Big Bear Creek near the Utah – Wyoming Border, and Clear Creek near Lawson Colorado, and a variety of others. If this “cornrow” approach to time series representation is acceptable, then it continues to confirm the absence of any indication of the Early Spring. Clow, D. W. 2010. Changes in the timing of snowmelt and streamflow in Colorado: A response to recent warming. Journal of Climate 23(9): 2293-2306.